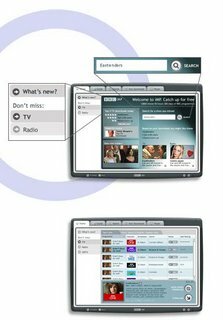 BBC - iMP: "iMP is an application in development offering UK viewers the chance to catch up on TV and radio programmes they may have missed for up to seven days after they have been broadcast, using the internet to legally download programmes to their home computers. iMP uses peer to peer distribution technology (P2P) to legally distribute these programmes. Seven days after the programme transmission date the programme file expires (using Digital Rights Management - DRM - software) and users will no longer be able to watch it. DRM also prevents users emailing the files to other computer users or sharing it via disc."